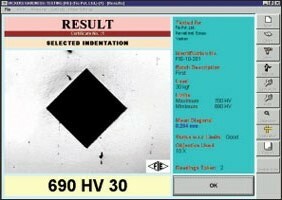 Fully Computerised (PC Based) Vickers Hardness Machine. Direct and accurate measurement of Vickers Hardness number using "State of the Art" image processing technology. Wide testing range : from soft metal up to hardest. User friendly software with Windows Features. Batch file Processing : Option for Data, storage and reports generation. Statistical Evaluation : Software forcalculating standard deviation, mean, medium, histogram etc. Calibration / Verification on PC monitor makes easier to operate. 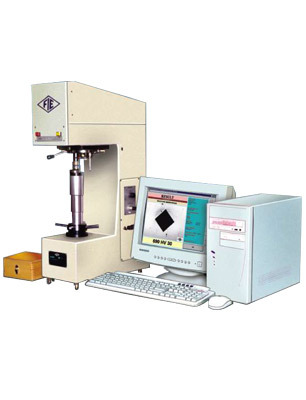 'FIE' Computerised Hardness Tester is a simple and accurate means to produce automatically measure the diamond indentation to give Vickers hardness numbers. These testers are suitable for measuring the hardness of precision metallic parts with wide testing range - from soft to hard and their accurate results are widely acclaimed. These testers strictly confirm to IS 1754 - 2002. Intel Pentium IV 2.00 GHz or above processor is recommended. The robust machine frame is designed to accommodate the high precision loading. Specimen is placed on a testing table. The test cycle is fully automatic. The accurate load is applied on a diamond indentor by means of a lever and weights. After a specific lapse of a time the load is removed automatically. The image is digitized using a CCD camera fitted on the machine and is captured by PC. The diagonals of the indentation are automatically measured by PC to give the Vickers Hardness Number.